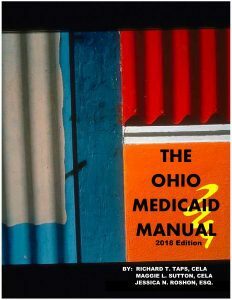 The Ohio Medicaid Manual began as a little book designed for clients, but it evolved into a three-ring binder in 2008. This book is now used as a training manual for attorneys during an annual seminar hosted by Taps & Sutton, LLC. Our most recent seminar was held on October 11 and 12 at the Central Ohio Area Agency on Aging. In August 2016, Ohio transitioned to a 1634 Medicaid state, which brought many regulation changes. Some questions are yet to be answered, but we are continuing to stay on top of the changes and effects on Medicaid applications across Ohio. Past seminar attendees and book purchasers are added to a list for email announcements for future seminars. If you would like to be added to the list, please contact us. You can view the Table of Contents for the Ohio Medicaid Manual here.